I've been traveling for work in Asia lately and came home with a little tummy bug. The funny thing is, I am pretty positive it's not from something I ate in Thailand, but actually something I ate on the airplane! Yikes. When you've been gone so long and eating all sorts of fresh, spicy and delicious food, you want a bit of comfort food. I had saved this recipe from a Food & Wine issue as it looked delicious. I am happy to say this one is a keeper. 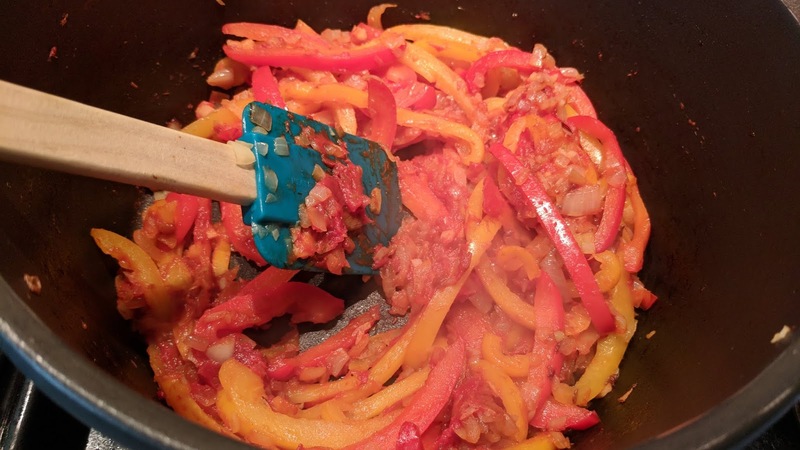 Easy to make, mostly healthy and not too spicy. 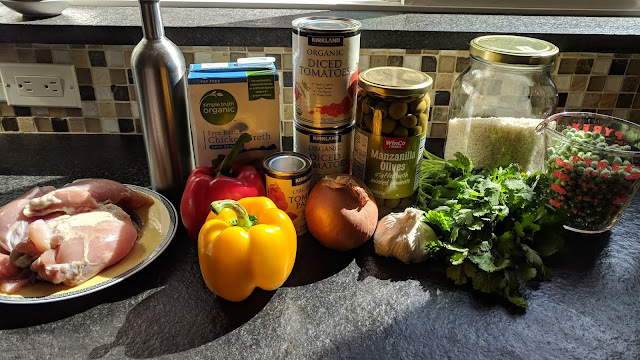 This makes a large batch, and I had to swap out my 5.5 qt dutch oven for my 7 qt dutch oven once I got all the ingredients into the pan and ready to cook it. I could tell that once the rice cooked, it was going to overflow, so plan accordingly. 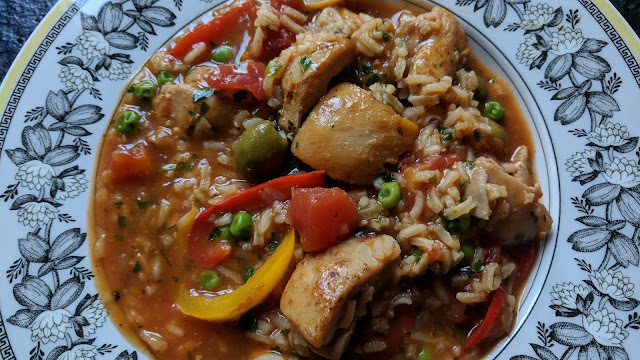 These leftovers make great lunches, but it isn't as saucy when it gets reheated as the rice continues to soak in all the liquids. No worries... I think you will still enjoy it. 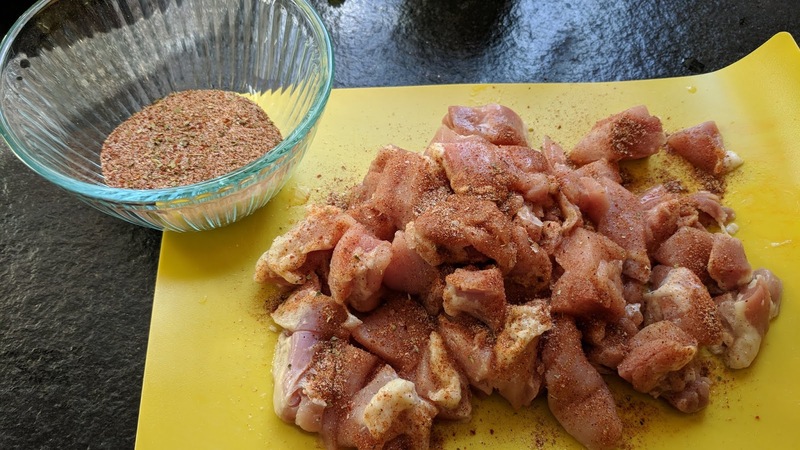 The recipe calls for Adobo seasoning, which I didn't have, and since I had all the spices I needed, I made some. 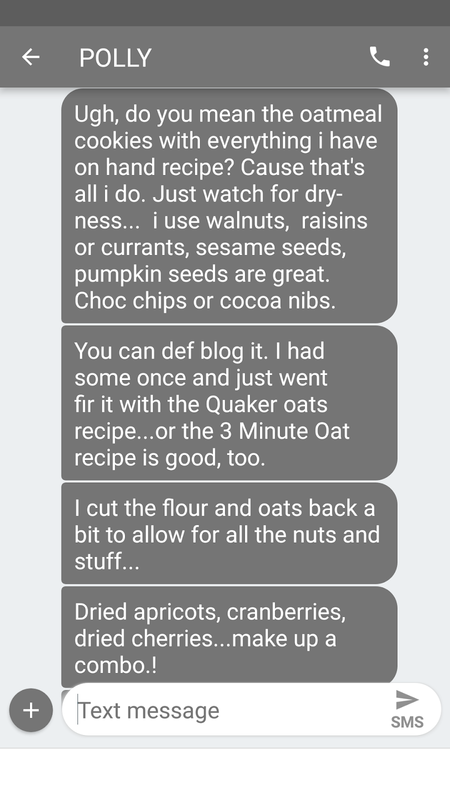 At the end of this post is the recipe I found online for Adobo seasoning. I did reduce the salt as I felt it was too salty, it would be better to add your own salt than risk over seasoning with this mix. In a large enameled cast-iron Dutch oven or heavy pot, heat 3 tablespoons of the olive oil. Season the chicken with the adobo and black pepper. Brown the chicken in 3 batches over moderately high heat, 6 to 8 minutes per batch, turning each halfway through. 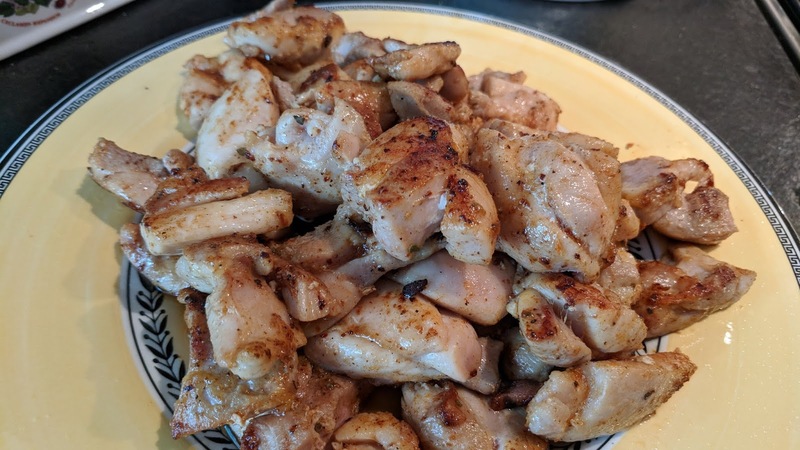 Transfer the browned chicken thighs to a plate. In the pot, heat the remaining 2 tablespoons oil. Add the bell peppers, onion, and garlic to the pot, and cook over moderate heat, stirring occasionally, until softened, about 6 minutes. Stir in the tomato paste and cook until it turns brick red, about 1 minute. Add the chicken stock, tomatoes and their juice, 2 cups water, bay leaf, and crushed red pepper. Bring to a simmer. Return the chicken to the pot, stir in the rice, and cook, covered, over moderately low heat until the rice is tender, about 20 minutes. Season with salt and black pepper. Stir in the peas and olives, and let stand until heated through, about 1 minute. Sprinkle with cilantro before serving. Here it is once it was browned. 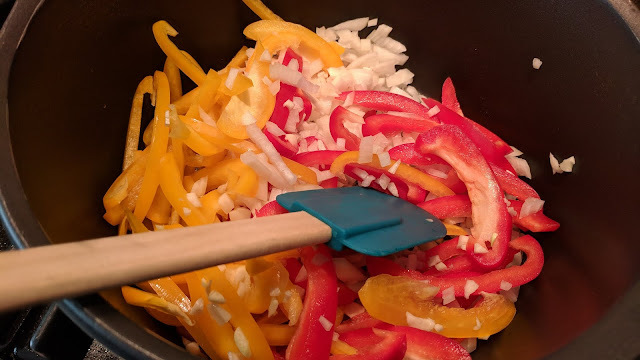 Peppers, onions and garlic, oh my! I know now why Elvis is dead. If this is his favorite cake, then I know he ate entirely too much sugar! LOL, it is a delicious cake though, and very, very easy to make. 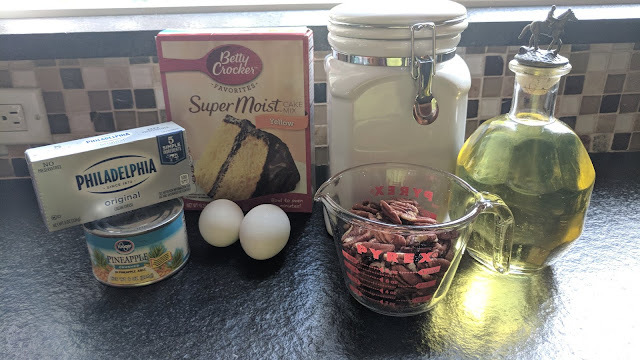 I was very intrigued when I saw this recipe online, but I was expecting that an Elvis cake would be peanut butter, banana and bacon. I mean, I always heard that was his favorite sandwich? Obviously Elvis needed the help of a good dietitian. This is a great recipe to bring to a pot luck, it travels well and it is very moist and yummy. Prepare cake according to instructions on the package. 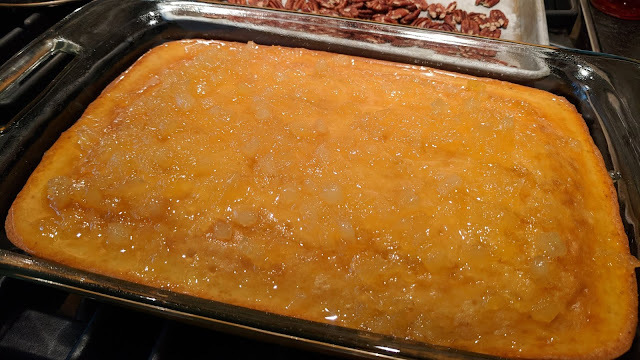 Bake in a 9 x 13 inch pan. Allow to cool. Combine pineapple and sugar in a saucepan. Bring to a boil. Spoon over cooled cake. In a large bowl or stand mixer, cream butter and cream cheese until smooth. Add powdered sugar and beat until smooth. Add vanilla extract and pecans and mix well. Spread cream cheese frosting over the cake. 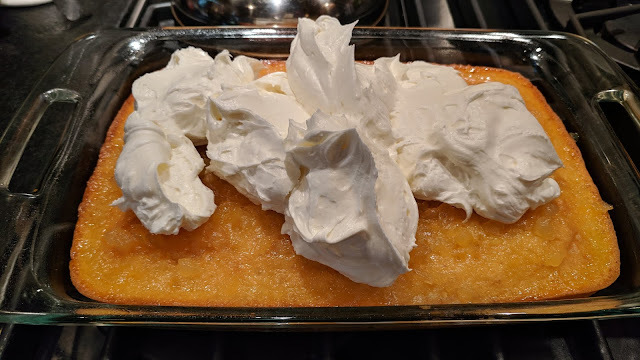 Here's the cooled cake with the pineapple syrup poured over. 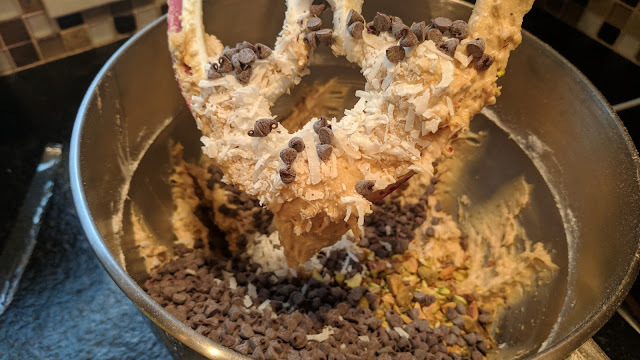 I used all of this frosting, but it was thick! It would be just as good with half as much frosting. 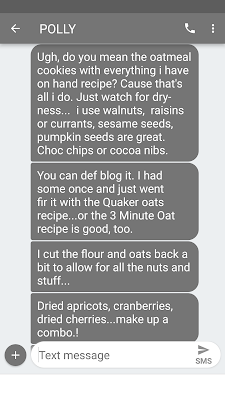 I texted my sister and asked about those "kitchen sink" cookies, hoping she'd send me her recipe for these fantastic cookies that she makes that have so many great flavors- fruit, nuts, coconut, chocolate- you name it, it's in there. She was funny, as you can see from our text interchange. 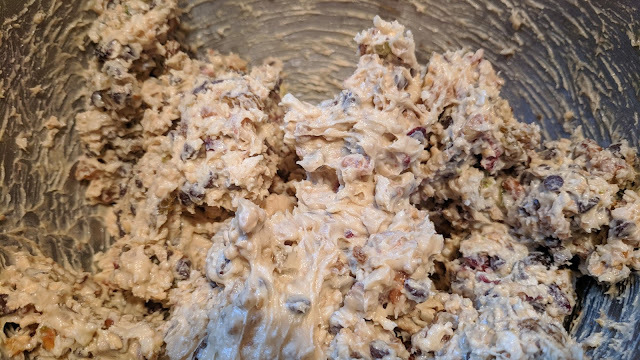 Since I didn't get a real recipe out of my sister, my recipe is loosely based this one from Martha Stewart. 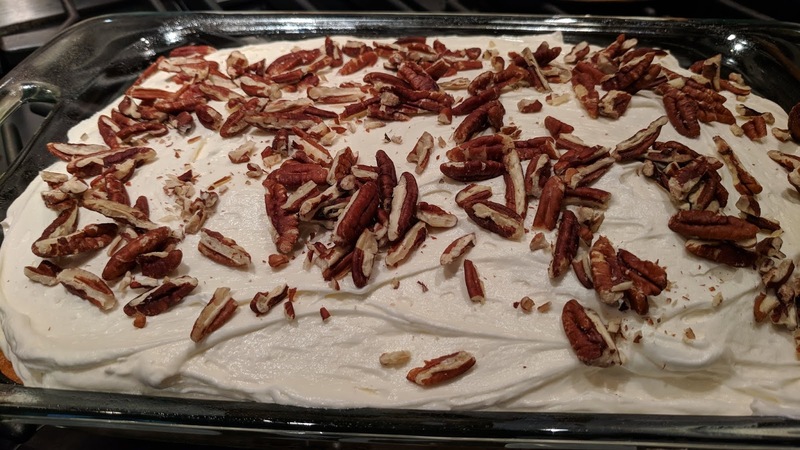 One note, I used walnuts in this recipe and didn't stop to taste them before mixing them up. Yep, my walnuts were bad/rancid and I did have to throw away my first batch as the bad taste permeated the whole batch. They say "one bad apple can spoil the whole cart", but why don't they say "one bad walnut can wreck the whole batch of cookies"?. Because it is a real thing! When in doubt, throw them out! 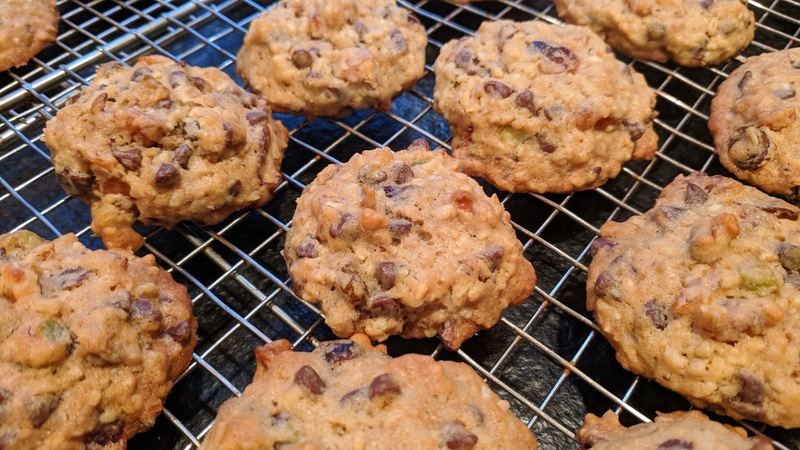 *Steel cut oats can be used in cookies and give it a crunchier texture. 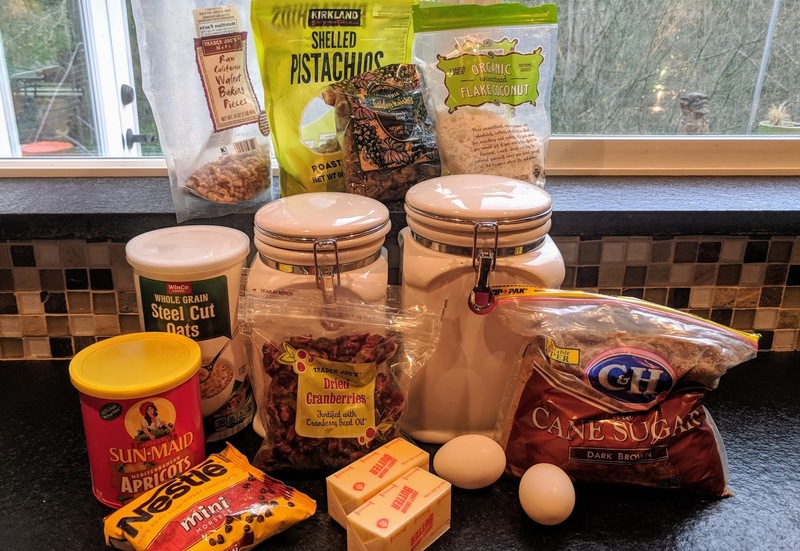 Regular rolled oats are more traditional. 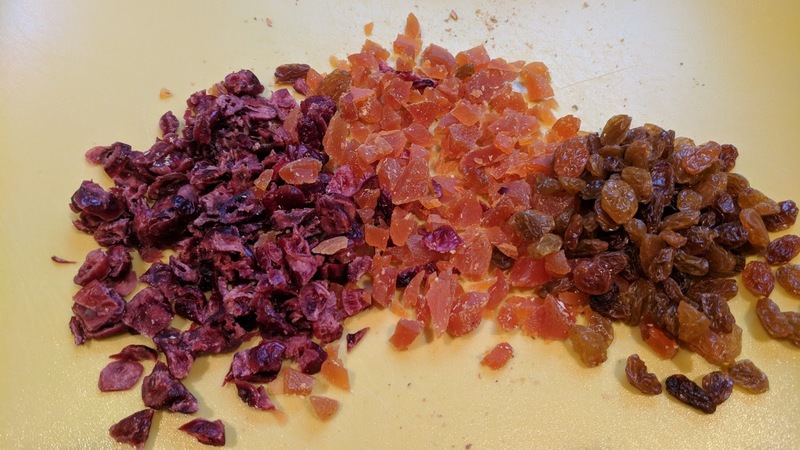 Below- I used dried cranberries, apricots and golden raisins. I like to use mini chocolate chips instead of regular size ones, but any kind work. It's a lumpy bumpy mixture.